Biased notes on risk, investment and life. We normally define a bank as an institution that takes deposits and lends them out. While this definition might seem adequate in most of the circumstances, it is not exact. The problem is, however, not of the definition only. Most of the existing writings, from daily business news to books on the business of banking, do use this rather simplified definition, what sometimes leads to wrong conclusions. What follows, is my attempt to sketch a precise definition for banks. The attempt itself is a result of a half a year inquiry into liquidity risk in the banking business which led me to believe that problem of definition is the reason behind many common misconceptions. My working definitions: a bank is a money-creating institution with fixed exchange rate. While it might also be too simplistic and not exact, it aims to deconstruct common belief that bank takes money from depositors and then lends it to the borrowers. How banks create money out of nothing? The common definition of banking says that banks take deposits from customers and lend those funds to the borrowers in need for financing. The key problem in this process being a mismatch of terms between deposits sourced and loans granted (maturity transformation). This definition, however, is nothing more than a simplification of the more complex process, and as always in such cases, some meaning is lost. To understand the problem one has to go back to accounting and look at the balance sheet during the lending process. When a bank grants a loan it becomes an asset to the bank. The bank asset is matched by a deposit in the name of the borrower on the other side of the balance sheet. Signing a loan agreement (before any other transactions are done) is an exchange of "I owe you" (IOU) contracts between the customer and the bank. The exchange does not require any additional funding and creates assets and liabilities for both, the bank and the borrower. The key difference between the two IOUs is that the one issued by the bank (liability of the bank) is what we call money. Creation of credit, therefore, is the creation of money in the form of deposits. While it does not require additional funds, as loan and deposit are created out of nothing by the act of borrowing, money creation is limited by the key characteristics of money. Before moving on to talk what are the key characteristics of money (deposits ) created by the bank, it is essential to sort out few details about what money overall is. I will skip the overall introduction and concentrate on key aspects related to the business of banking. In the modern world, we typically view money as a currency issued by a central bank or equivalent governmental institution. While all major currencies are either in the form of "fiat" money (has no defined value in terms of any objective standard) or have their value fixed to one of the fiat currencies, we tend to consider that dollars, euros or any other currencies in our accounts are IOUs of the government institutions. That is not the case. In advanced economies, the government issued currencies are (or at least were before the spree of QEs) only approximately 15% percent of all money supply. The only way for individuals and common businesses to get access to the government issued money is to deal in actual paper money (less than 5% of all money in most of the advanced economies. The other part of government issued money is only accessible to a few special institutions who are allowed to have accounts with the central banks - mostly banks and some other financial institutions. So who issued the other 85% of the money? Banks. The money we keep in our bank accounts is not government issued. What we deal with on a daily basis are not Dollars of the United States or Euros of European Union, but dollars of the Citi Bank or pounds of Deutsche Bank. Referring to all money as a liability of the government is once again a simplification. What restricts money creation in the banks? To qualify as money, the IOUs of the banks have to have certain qualities, particularly, to be convertible into government issued currency at short/no notice, at marginal/no cost and at a fixed value (normally one for one). Let's consider a loan granted to an individual. The bank can create the loan and a matching deposit out of nothing but the difference in their future behavior imposes limitations. The loan is likely to stick with the bank for a while, and the deposit will likely be converted to government issued currency. Let's say the borrower pays for goods in a shop with the borrowed money and the shop has their account with the other bank. In order to process the payment, the bank of the borrower needs to pay to the bank of the shop in government money. To go back to the balance sheet of the bank, deposit disappears and the drop in liabilities is matched by the drop in government money holdings of the bank. As banks tend to have less government money than they have deposits, to ensure convertibility of the bank money into the government money requires a bank to be able to replenish lost government money stock. The risk related to a failure of doing it over short run is typically called liquidity risk, while the risk of failure to do it over a long term is referred to as a solvency risk and depends on the quality of bank assets. Banks created approximately 85% of money supply in most of the advanced economies. This percentage is unfortunately exceeded only by a number of experts who rush with policy advice without understanding how money works. Each individual bank creates their own money (in all currencies they allow accounts in). This creation is only restricted by a need to maintain convertibility of the bank money into government money. Fundamentally, this restriction is no different from the self-imposed restriction on the government money creation during the years of Gold Standard. While regulators and banking industry re-debate use of models to determine capital needs, hardly anyone debates model literacy. What is model literacy? I would define it as out ability to use models correctly. Many think of models as complex mathematical beasts created and appreciated by mathematicians and alike. Few come to realize that we use them on a daily basis. Model is nothing more than a operationalized metaphor. Every time we say that "X is like Y", we use Y as a model for X. It is true for the complex financial models used in the banking industry, it also true in for simple models we use in our daily lives. For the sake of an example let's consider a person who has a domestic cat , but does not know what the tiger is. It is easy to see how a simple model "tiger is like a big cat" could substitute a detailed description of a tiger. At the same time, it is obvious that the model has limitations - it does not capture the full essence of a tiger. The most common ways people deal with model risk are - ignoring the risk or rejecting the model. Those who ignoring model risk tend to embrace them as an ultimately knowable truth. While they tend to accept that model is not a perfect representation of reality, they also tend to consider that it is the best knowledge we have. One can easily see how model "tiger is like a big cat" could backfire during safari for someone used to playing with his pet. Rejection of models is the other extreme especially pronounced in individuals who used models unsuccessfully. They consider models to be useless and judgment a superior way of making decisions. And they were shown to be wrong so many times. How to manage model risk? "Essentially, all models are wrong, but some are useful" by G.E.P. Box is probably the most used and abused quotes about modeling. However, it summarizes two key aspects of any modeling effort - knowing how the model is useful and where it is wrong. Going back to cat example, "tiger is like a big cat" is perfectly reasonable and usable model to recognize tigers in the wild. Using the same model to set safety restrictions could lead to undesirable outcomes, however. But knowing limitations of the model allows to substitute it for "tiger is like a bear", in this case, what would yield a lot batter outcome. Using multiple models that compliment each other is often the best model risk management approach. Doing it correctly, however, requires high level of model literacy. It is probably time to go back to model risk financial risk management. While one intuitively would expect people who do model for living not to be that simplistic, my personal experience suggests that at least in finance this is not a case. Even PhDs in Statistics tend to forget key ideas behind models, not to mention executives who have to use mode outputs. Many chief risk officers in their decision are ignoring model risk, rejecting the models or, most often, both depending on the issue at hand. Even post-crisis debate on VaR is dominated by these simplistic positions. One side is saying that VaR is useless, the other insists that it still should be the key element of the decision-making process. Few question overall use models in the financial industry and need to make us better skilled with model outputs. No matter how good the model is, no good decisions can be made by users who do not understand what the output really means. 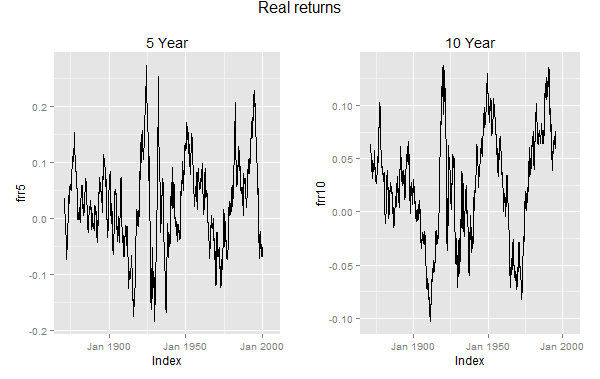 Predicting future returns with R: are returns stationarity? I spent probably at least a year of my life building models. While it was and is part of my work, I always keep the words of George Box in my mind. As a risk manager, I always considered that models aiming to predict were among the least useful. First days of this month, however, I ended up studying economic forecasting. While it did not change my view on usefulness of forecasts, it managed to make me a little bit curious. 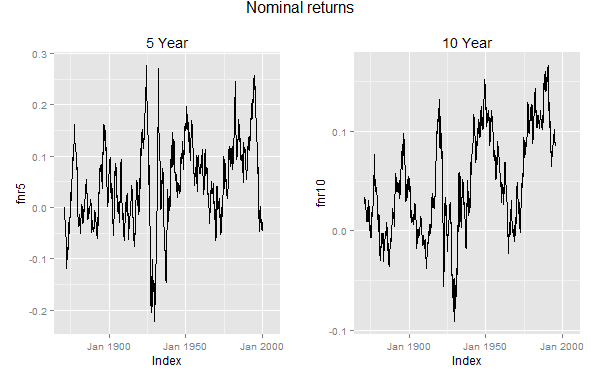 This and potentially few following posts are an attempt to apply some of the statistical techniques (and R) to predict long term future returns of S&P 500 index. 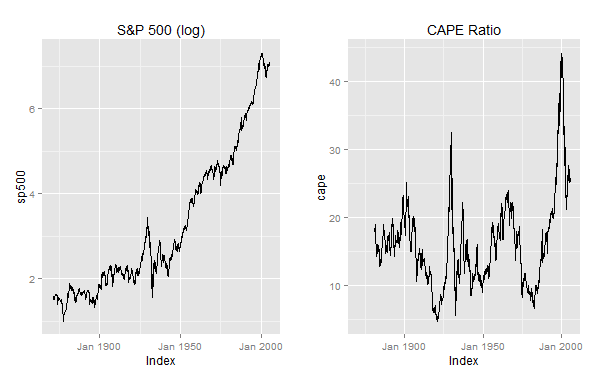 The endeavor will naturally start with investigation of Prof. Shiller’s CAPE ratio and it’s predictive power. The first step is getting the data. For that I will use Quandl.com, that already has Shiller’s data set. The data for S&P 500 start in Jan 1871 and continues to May 2015. Second step is to calculate historical future investment returns. I will continue with both nominal and real returns. As future 10 year returns are available only starting May 2005, that will be a natural limitation for the analysis. From this moment I will consider data from Jan 1871 to May 2005 as my full series. Any attempt to predict using statistical methods should start with answering whether the data is stationary (simplified: mean reverting), as future steps should depend on it. So, are the market returns stationary? While in theory they should be, quick look at the plots suggest that it might not necessarily be the case. To check whether return data are stationary I performed Augmented Dickey–Fuller Test and it did not confirm my thought of non-stationarity. However, same test performed on data starting in 1950 gave probabilities of non-stationarity between 14% and 60% for different return series. In any way I will proceed with assumption that returns are stationary. In the next post I will investigate properties of the CAPE ratio and then move to building a first model. For me beta is a synonym to the state of choicelessness. To earn a true beta you have invest proportionally in all investable assets without discriminating any of them. Any choice, voluntary or forced, to deviate from this pure theoretical set of all investible assets is an exposure to alpha. As investing proportionally in truly all investable assets is not possible nor desirable, each investor is always exposed to at least few choices in building her portfolio and therefore is condemned to earn alpha (not necessarily positive). Passive vs. active investing debaters often use beta and alpha as synonyms to corresponding strategies. While they are definitely overlapped, there are some differences between being passive and being "beta investor". True beta is earned by owning equal share of all investable assets. It is a purely theoretical concept. For me, passive investing is holding a group of funds tracking some wide market capitalisation weighted indices. Therefore passivity refers not to absence but rather low frequency of choices. Passive investor makes choices only when she creates a portfolio. This kind of investment process however exposes portfolio to a bit of alpha. Index (instrument) alpha - is earned by investing in instruments . We often talk of some index tracking ETFs as representing wide asset classes, however they are selective portfolios. There are two levels of choices included here. First, there is someone who chooses which securities are included in the index. Second, ETF company chooses portfolio for tracking the index (they rarely invest in all the securities in the index). Each of these choices effect performance of the portfolio. Investment cost alpha - earned by making investment cost related decisions. Step into the active investing territory exposes investor to a variety of choices. Whether you limit yourself to tactical asset allocation, let an algorithm to define your portfolio or actively involve in stock picking, you definitely earn alpha (once again, not necessary positive). There are many alternative approaches investors and scientists take to classify active alpha. For me, as before, the type of choices made is the core criteria (even if sometimes it is hard to identify what are the actual choices made). Passive investing is often misdefined by using theoretical concepts of alpha and beta. Even if you are a passive investor, you do make or have made decisions that effect performance of your portfolio. Thanks Christopher Schelling for inspiration. I think many would say that it depends. For many it depends on how much you have. Typical belief is that if you are a billionaire, it can be a burden, and if you are poor, it is a blessing. But how it is for those of us, who are stuck in the middle? How is it for those of us, who patiently save for their retirement? The questions came to me after my last conversation with my mother about her investment portfolio. Over the last few years I managed to steer her portfolio towards cheap and efficient investing. That is why it surprised me to find there two funds of funds with an average expense ratio over 3% during my last portfolio review. How did they get there? I remember the answer included "you were traveling", "I got some spare money" and "the bank staff advised". And then it hit me - making savings decisions is a burden. We want to make decision fast, without much thought and forget (and earn high returns with no risk). My intuitive answer is automation. The less decisions you have to make every time extra money comes in, the better. My second answer is education. My mother, like many other people, do delegate understanding of financial topics and there is nothing anyone can do about it. The only way to help is to explain how to identify a good advice. Risky behaviours are those that potentially expose people to harm, or significant risk of harm which will prevent them reaching their potential. Some risky behaviour is normal and part of growing up.